Well...I'll start with the bad news. I was not accepted to Crafty Bastards this year. I was how ever put on a waiting list so all hope is not lost. right? In any case I hope to be able to go and do some shopping. The D.C. crafty bastards fair is by far one of the best and coolest craft fairs i've been to. The good news is I'm still making and creating... i have a new line of mooshy gooshie wear- tees for kids - which i hope to start listing in my etsy store within a couple of weeks. I'm also happy to say the Mooshy Gooshies Onsies were just featured today in the OTTOWA DOG BLOG. Of course I'm still making fun new jewelry items such as these new carved black lacquer rose cufflinks along with some fun necklaces such as the coral and coin pearl necklace, and the layered sterling grey pearl necklace. 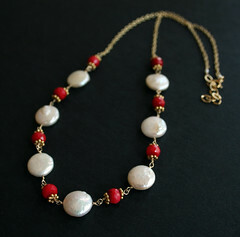 I've been playing with various types of chain as well and having fun with the simple results. Look forward to sharing the new designs with you soon. Well I'm off to visit NYC for the weekend. I'm really excited to check out the prefab architecture exhibit at the MOMA as well as the green canopy installation at PS1. Your blog is so personal, it really brings you across well. You are really doing a great job with using it to promote your work while keeping it feeling intimate. I love it, and I love you!